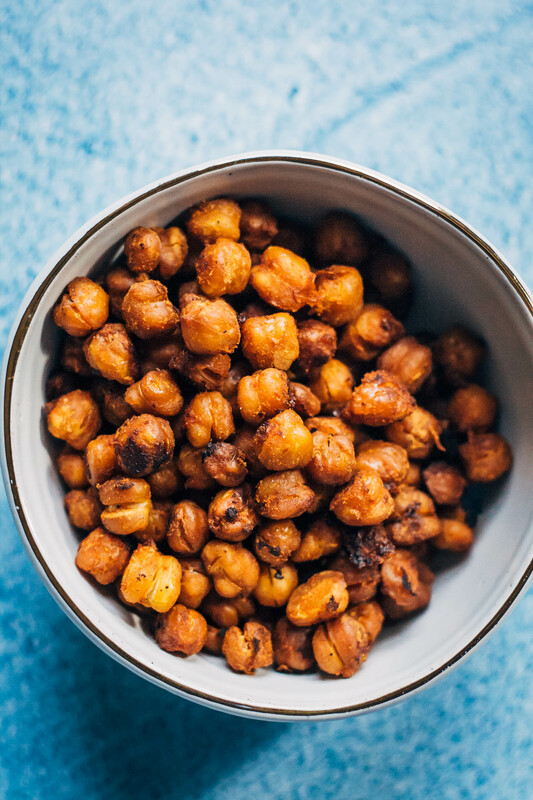 First of all, credit where credit is due – I got the idea to make vegan bacon chickpeas from My Darling Vegan, a blog that has amazing, plant-based recipes. When I saw Sarah’s post, I knew I wanted to create a similar recipe with my own spin on it. What I ended up with is almost the exact same recipe as my vegan coconut bacon, with slightly different instructions. These vegan bacon chickpeas are super healthy, full of umami flavor, and made without liquid smoke. I loved them on top of a salad, but these would be perfect in tacos, wraps, or toast too. 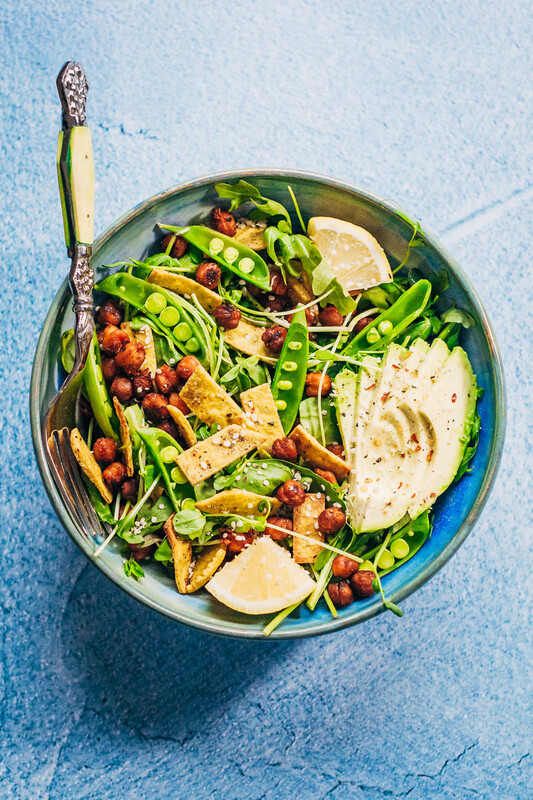 These vegan bacon chickpeas are insanely addictive - they're savory, a little spicy, and packed with plant-based flavor! To start, rinse and dry your chickpeas. Then, individually remove the skins from the chickpeas. I know it's tedious and annoying, but it's crucial for this recipe's success! But seriously though, don't skip this step!! In a plastic bag, add in chickpeas, olive oil, tamari, sriracha, maple syrup, and smoked paprika. Shake up the bag so the chickpeas are evenly coated with everything. Marinate the chickpeas in their bag, in the fridge, for AT LEAST an hour. Preferably marinate them overnight, so the flavor can really infuse into the chickpeas. When they're done marinating, preheat the oven to 425 degrees F.
Put the chickpeas in a colander or strainer, and strain out the marinade. DO NOT rinse or dry the chickpeas! You still want a little marinade on them. 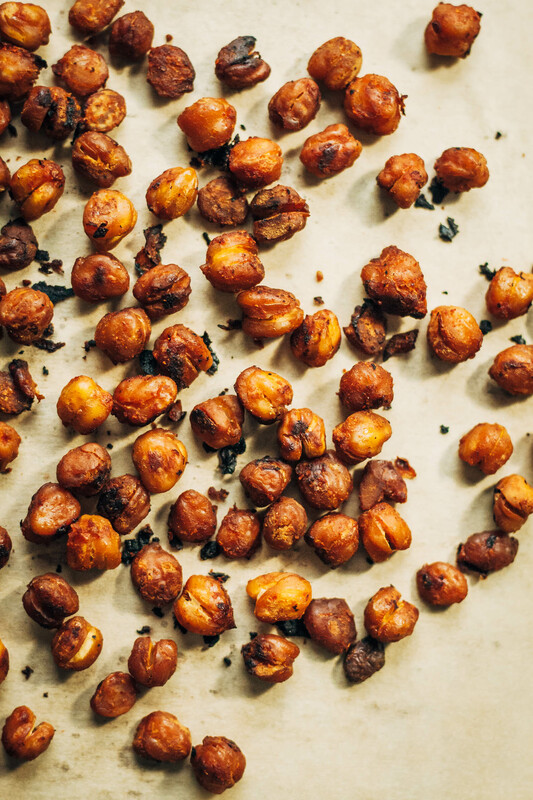 On a baking sheet lined with parchment paper, bake chickpeas for 20-25 minutes. When done, let cool and enjoy!! These are dang delicious in a salad, but they're be great in tacos or on toast! If you're interested in making the salad in the pictures, here's what you do - add a bunch of mixed greens to a bowl. 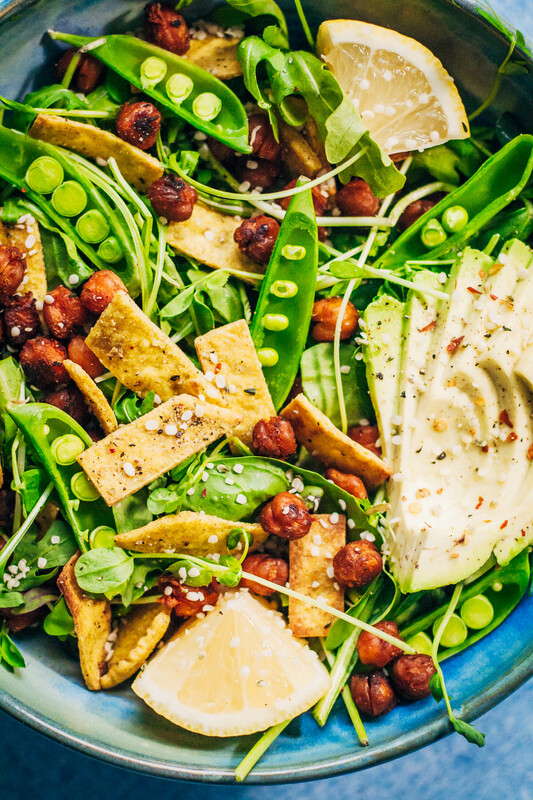 Top off with sugar snap peas, crispy tortilla strips, sliced avocado, hemp seeds, and the bacon chickpeas. Serve with your fave dressing, and a squeeze of lemon, if you like. Be sure to top off with fresh cracked black pepper and red pepper flakes if that's your thing! Hi Sarah – I don’t know why I have never considered crispy bacon chickpeas – brilliant!!!! As for jaw clenching…I do that during the DAY when I am stressed….It really affects your whole head/mood/everything when you’re not able to relax your jaw. Advice on the internet didn’t really get me very far. But what has did work for me was treating the root holistically ie – I wasn’t eating enough protein, didnt have a healthy outlet for stress, adrenal overload, etc. I’ve noticed that I clench during the day too! I don’t even realize I’m doing it until it’s too late. I’m definitely working on reducing stress though, which I think is at the root of a lot of my problems. 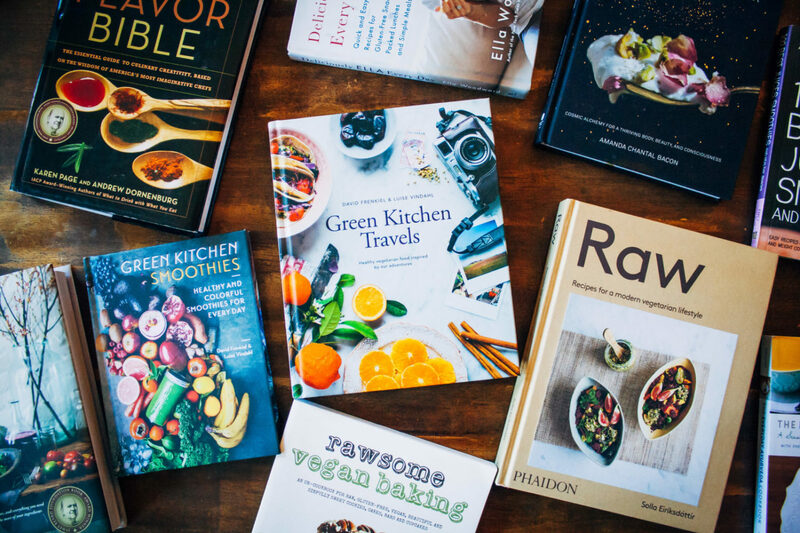 We’re trying to eat with no added oil to the recipes we make. It’s there a substitute for the oil or can we just leave it out? Anything vegan and chickpeas I’m game! These look awesome. The only relief for my teeth clenching was a very small dose of muscle relaxers before bed. Our muscles have strong memory responses and just sometimes need the help to stop. Thank you Karolyn! I will have to ask my doctor about muscle relaxers…. it’s so hard not to do something when you’re asleep and it’s habit! I’m a dental hygienist and you are definitely not alone with the stress clenching! I see so many patients just like you. I think the hot water bottle/moist hot towel is a great idea, but I definitely think you need to talk to your dentist about getting a nightguard to protect your TMJ and your teeth while your clenching. I have also found that upper body stretches-those to include your shoulders, back, and neck can be very helpful since literally everything is connected! Hope this helps you out! PS: those chickpeas look amazeballs, they are going on my to-make list now! Hi Sarah! Thanks so much for writing, I really appreciate your advice! Since I wrote this post I actually did get a mouthguard from the oral surgeon I saw :) But he didn’t recommend the stretching, which sounds like a really solid thing to do to help. I’m going to try that out tonight! :) Thanks again! I have to try the recipe for vegan bacon chickpeas. It looks like it will work so well. I can’t wait. How do you store extras? 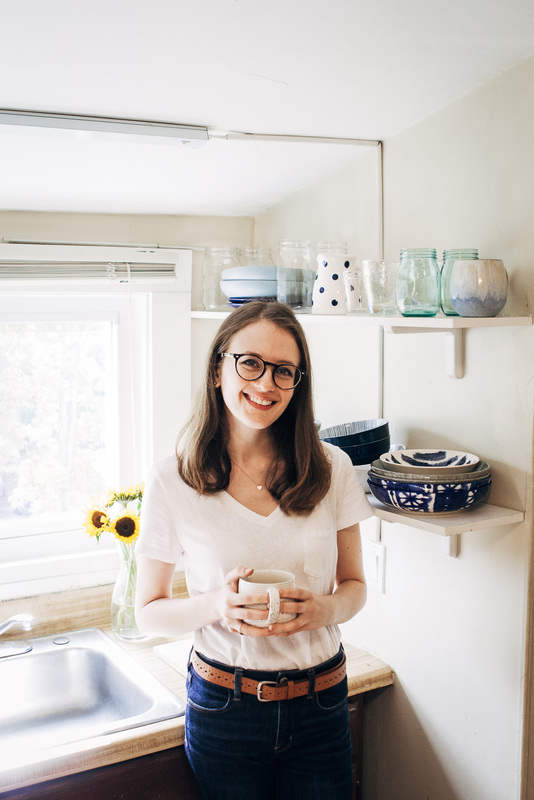 Welcome to Well and Full, a recipe blog where I share my adventures in a vegetarian kitchen! Copyright 2018 | Well and Full | All Rights Reserved.